Samile Bermannelli (Elite) photographed by Tom Newton. Makeup by Yacine Diallo. Hair by Clara Leonard Styled by Carolina Orrico. Welcome to the time of year when not looking like a piece of ashen, freeze-dried garbage becomes a daily struggle. The wind and cold and radiator terror will endlessly try to undo your best beauty efforts no matter how many serums you apply. Your pricey foundation won’t do you any good when it’s all over your winter accessories (because you covered your face on the walk to work with a scarf to hide the ashen, freeze-dried-ness while cowering in the wind). If you can strike the balance, though, a bit of cold weather can be a good look; nobody does rosy cheeks quite like a freezing wind chill. French makeup artist Yacine Diallo gets this. In fact, she has mastered the art of cold weather makeup in two looks, each of which is simple enough to do every day. Bonus points for the products that actually protect your skin while making it more colorful. You're covered in every sense of the word. "Samile [our lovely model] is from Brazil, and she never really experimented with makeup growing up," Yacine says. "I wanted to explore with her the possibility of using colors she would probably never reach for on her own—AKA the 'cold' tones: greys, blueish pinks and light beiges." But it's winter in NYC, and that poses a problem. "Samile and I are dark skin girls, and today it’s dry, cold and our bronze-y complexions are definitely a sweet memory from several months ago. So together, we went through my kit and created two easy looks that make us feel pretty despite the cold." She also promises: Winter will be over in no time. First up: How to appear clean and polished in spite of the weather. It's all in the blush. 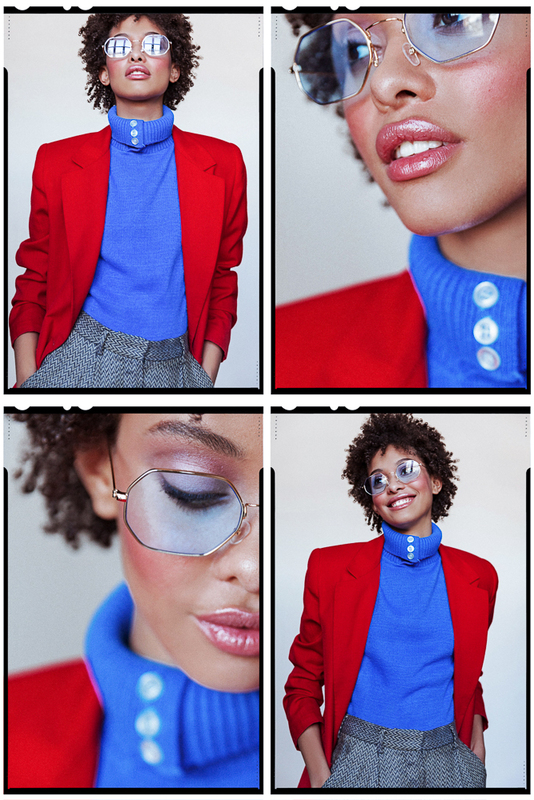 Here, Yacine used Glossier Cloud Paint in both Haze and Puff mixed together. "I love them because they are easy to apply, sheer and buildable at the same time, and almost mistake-proof" she explains. Using a duo fiber blush brush, she diffused the pigment onto the cheeks until it became "a pretty raspberry color." The lips got a nice coat of Chanel Rouge Coco Lip Color in Julia (Editors note: discontinued), which is "a light medium beige color that's got a moisturizing-yet-lightweight texture, with a micro-shimmer and a luminous sheen." The goal, she says, is lips that aren't too pale or dry. To create the soft, matte eye look, Yacine used a blendable shadow brush with the Tarte Tartelette Amazonian Clay Palette. She applied the lightest shades from the palette all over Samile's eyelids "to brighten and unify." Then, she mixed the next four shades (Natural Beauty, Wanderer, Best Friend, and Power Player) to create dimension and intensity. The trick with this look is that "basically, you can't go wrong," Yacine says. "The colors are really softly pigmented, and the textures blend easily. Just apply whatever color you prefer and build the intensity as you wish." Brush up your brows and finish with mascara. Of this look, Yacine says it "gives the illusion of a really fresh glow and rosy cheeks;" like a winter version of the no-makeup makeup look. To start, she says to prep your face with a good moisturizer like Embryolisse, which is heavy without being to greasy. Be sure to massage it into the skin "to activate the blood flow. Don't forget to massage under your eyes and eyelids!" Next, she tells us she "just wanted to bring a little definition to the eyelids by dabbing on a little bit of Power Player eyeshadow from the Tarte Tartelette Amazonian Clay Palette—a taupe-y grey that just gives a little bit of a hazy shadow." It's not hard to do on your own: "You can do it with your finger—it doesn’t have to be precise." That's not to mention, she says, that the mineral pigments in the powders themselves are gentle on the skin. Next is blush—Nars in Mata Hari, "because it's a dark cool pink that's quite an intense color." Apply "with a very light hand" using a duo fiber brush on the bridge of the nose and the cheekbones, "right where you would naturally blush from the cold wind." Then for some added glow (that's also protection from the cold), apply a lightweight facial oil, using the same brush. "It will mix with your blush and give you a fresh, dewy, naturally blushed face." Yacine says her favorites are the Chanel Huile de Jasmin, or Aesop's Fabulous Face Oil, but that any oil, apart from coconut, will do. Top it all off with a balm on the lips—"I love Dior Addict Lip Glow Color Reviver Balm 001 and brush your eyebrows up, coating them in a swipe of waterproof mascara to finish.